It's starting to look like Google is getting back into the rhythm of regular releases after the holidays. It feels like forever since the last Play Store update began its rollout. We've got a new version for you, but this one doesn't seem to be sporting any user-facing changes, just a lot of bug fixes. However, a deep look inside reveals a lot to get excited about. Of course, if you stumble onto anything we've missed, let us know in the comments. For anybody eager to get straight to the download, a link is at the bottom. For everybody else, it's time for a teardown. Google never stops tinkering with the look and feel of its apps, and that's usually a pretty good thing. The new experiment appears to be an updated and redesigned Details view. In the short period of time I've had to look at it, I get the feeling there's still a bit left to finish, but it's hard to be sure since many of the components of the Details screen will be recycled from the old version to the new one. For now, the new interface is locked up by a debug option (shown above) that is only available to Googlers. However, Xposed users can probably enable the new Details view by simply overriding com.google.android.finsky.navigationmanager.NavigationManager.shouldShowDetailsPageV2() to return true. I'm not set up to test this myself, but I suspect it won't take long before somebody else checks it out. It's a plainly obvious Google is working to give more options to businesses. A couple of months ago, a new string appeared that gave a fairly concise hint that companies will be able to purchase apps for their employees. With the latest update, it looks like Google is expanding the flexibility corporations have with custom apps. A new string clearly describes a situation where businesses will be able to self-host their own apks for distribution to employees, and even restrict downloading of the apk to a private network, if desired. The wording seems to include a subtle, yet ominous implication that self-hosted apps may contain malware, which could be a polite way to discourage this practice. Still, the ability to distribute in-house applications through the Play Store without posting them publicly will surely appeal to a lot of companies. This is a great way to maintain privacy while continuing to take advantage of Google's infrastructure for simple app updates and notifications. Both Apple and Google (thanks, Ziad K.) have offered the ability to publish private apps for quite a while, but this will be the first time that any company has been able to keep keep the app completely in-house. Alongside the discovery that apps could be purchased by the enterprise, there was also a very compelling discovery related to "Reward Vouchers" with the ability to discount things on the Play Store. While the details remain as cryptic as ever, the latest update happens to expand on this feature just a little bit with a set of new icons that will be shown alongside an app that qualifies for a "reward." Perhaps the single interesting detail is the final icon, which isn't tied to a single segment of the store. Perhaps it will be used for generic vouchers, or it might be used in cases where a single voucher encompasses products from multiple segments (e.g. a game that also comes with a movie). Honestly, this one isn't that special, but I thought it should be mentioned anyway. The Play Store is going to start prompting users to answer questions about their experience on the Play Store itself. It appears to be a fairly generic pop-up dialog with a single question, most likely to avoid being too obnoxious. Users will have an option to decline to answer the survey, if they like. So... yeah... The secret is out, don't be too surprised when it happens. I'll just say it right now, don't get too excited about this one! This is new, and it's interesting, but it's not likely to ever be available to regular users. With that said, this is a feature basically everybody outside of the USA wants. Google has built in a special flag that allows some users to spoof a presence in another country of their choice. The purpose of this function is to give Google's own engineers the ability to quickly switch between countries for the purpose of conveniently testing things like app availability, differences in the text or pricing on listings, and other elements that may be affected by geography. 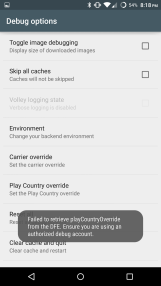 <string name="debug_play_country_override_update_success">"Your new Play Country: %1$s"
Again, this is definitely just a tool for Google employees. 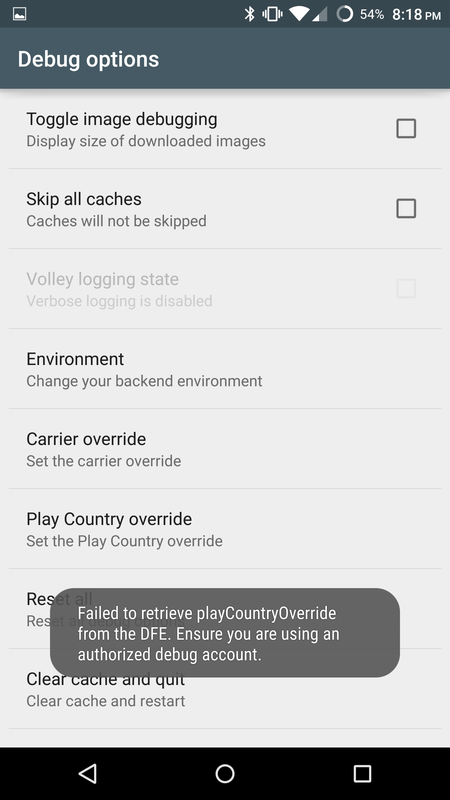 Not only is the setting located in a debug preferences screen, which is generally only visible to Play Store staff or through the use of hacks, but some of the error text makes it pretty obvious that this capability is restricted to pre-selected accounts. In other words, if Google hasn't specifically decided to offer this feature to you, it seems unlikely that a hack will enable it. Sorry, I know how much people would like to have this, but I think we all know there are tons of legal ramifications. If there weren't, the Play Store wouldn't need geographical restrictions in the first place. Digging through code and resources can occasionally result in great discoveries like the ones above. Sometimes, there are just a few oddball bits and pieces that are just worth mentioning, but not necessarily special. One thing I found of particular interest is some new code in a package named 'search.' It looks like this may be the client-side component for updated search and suggestion engine. For now, this is mostly guesswork, as the code may have been a minor rewrite or the side-effect of some reorganization. If this is wishful thinking on my part, it's based on how much the Play Store really deserves some improvements in this area. Whatever the case, I'm optimistic. Another minor item of note is a new icon named store_ic_player_badge. I've got a hunch that this is meant to be shown next to players when they are actively social with games, but it's not used anywhere in the code yet, so there's no way to be certain.